Celebrate the healthiness and let your body say wow. 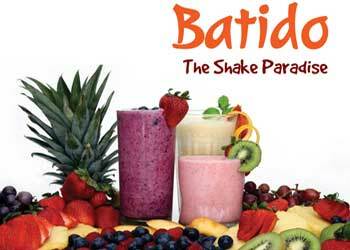 Let's hangout at Batido – the shake paradise in boring road Patna. The ultimate hangout place / cafe for fresh seasonal fruit shakes and juice, vegetable shakes, dry fruit shakes, milk shakes, coffee, frozen drinks and variety of healthy and refreshing juices / smoothies. are you fan of cocktails or mocktails beverages ? We have the list categorized. Get advantage of fresh seasonal fruits, vegetables, dry fruits for a perfect day and enlighten your body and soul from inside. Batido, synonym word of Milk Shake, has established a repute among health and nutrition lovers in Patna for variety of shake recipes, juices recipe, smoothies recepes, ice-cream recipes, cocktails, mocktails, beverages etc. You can not find this type of shake gallery or shake shop corner elsewhere in Patna. It’s a challenge and if you win get a free drink of your choice at Batido. We spread smiles in families, children, friends at very affordable price. Whether it is summer, winter or rainy season, we have refreshing and healthy juices, shakes, beverages drinks and smoothies which can delight your body and life. The recipes – full of nutrition and proteins – you cannot ignore. See our menu and you can’t stop yourself coming to Batido, the first shop / store of its kind in boring road, Patna, Bihar for delicious and refreshing shakes and juices. If you like to get in at cafe coffee day ( CCD ) in patna then visit Batido Once. Weather you are returning from morning walk, getting out for a lunch, walking with friends in evening or just outing with family for dinner then come to Batido once and your feet will take you here everyday as we deliver happiness and smiles on faces free of cost with heart and soul. You will find Batido as the best hangout place or cafe. We are located at Near Gold gym, Nageshwar colony, Patna in boring road.